The Little Red Schoolhouse Nature Center is part of the Forest Preserve District of Cook County, in Illinois. The original schoolhouse building was used as a one-room schoolhouse from 1886 to 1948. After the building was moved to its current location, it reopened in 1955 as a unique type of school building. Instead of typical school subjects, children and adult visitors were taught about the plants and animals that lived within the forest preserve. This building was used as a nature center until 2010, when a new visitor center with more live animals, exhibits, and activity rooms joined the old school. 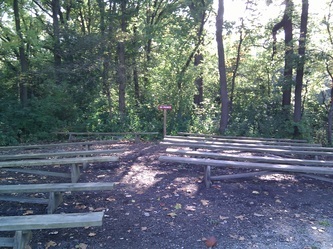 Above are pictures of the outdoor classroom located near the Little Red Schoolhouse. This outdoor classroom features a mulched area with 12 benches, 6 on the left and 6 on the right side. 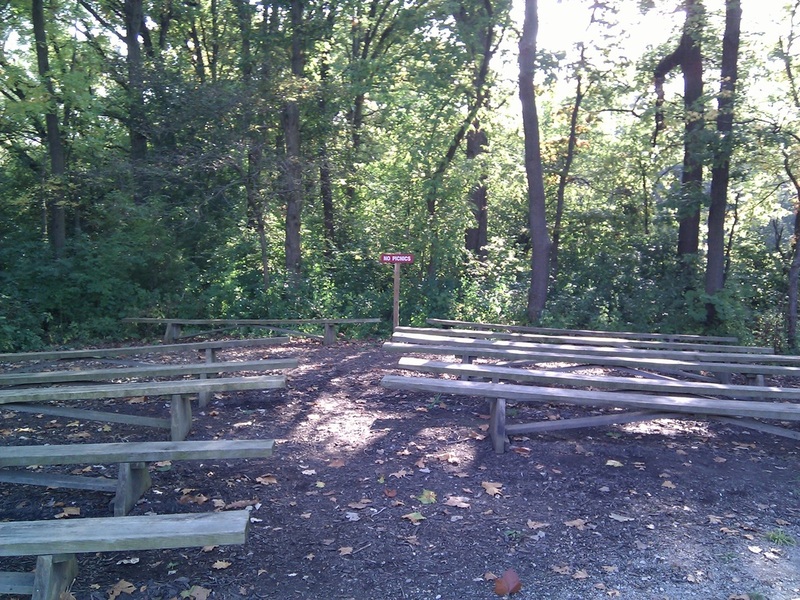 Each bench has the capacity of about 8 - 10 people, meaning the outdoor classroom has the capacity of about 108 people. All the benches are placed in the same direction, as to allow individuals to sit and face the front of the outdoor classroom area. At the front is an open space that would allow a teacher or other type of instructor. Images 22 and 23 show the classroom from a back view looking forward. As you can see, the area is large enough to incorporate this many benches. 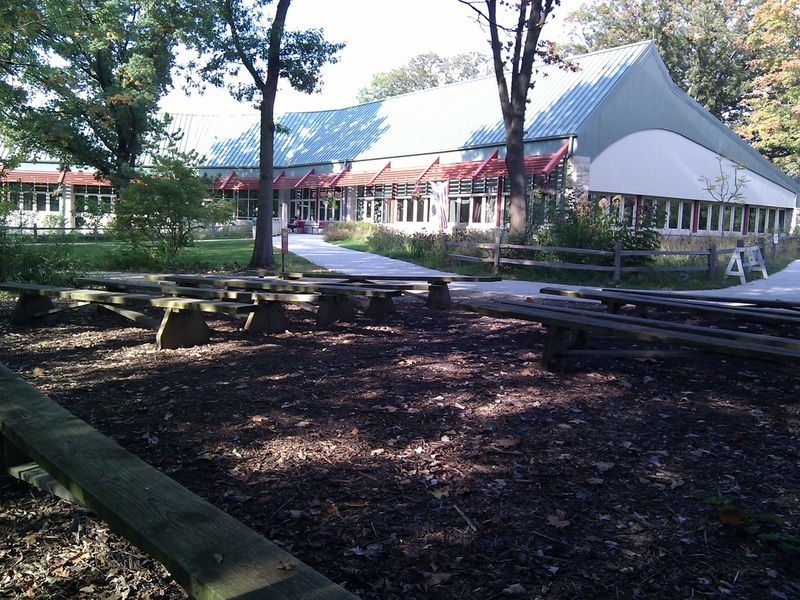 Image 24 has the outdoor classroom in the foreground with the newly built Little Red Schoolhouse Nature Center in the background. There are many walking paths and trails that lead to and from the nature center and the outdoor classroom. I estimate between 2 and 3 miles of trials within mostly wooded areas, also walking next to bodies of water. Image 25 is a picture of one of the bodies of water the walking trial goes next to. 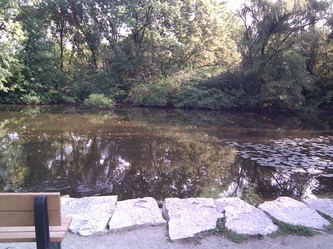 This small pond has benches next to it and stones that people may stand on to view the pond. Image 26 documents active wooden beehive boxes. 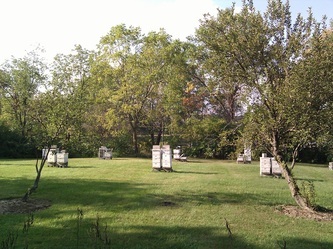 These boxes are located about 100 feet from the walking trail and are actively colonized by honey bees. 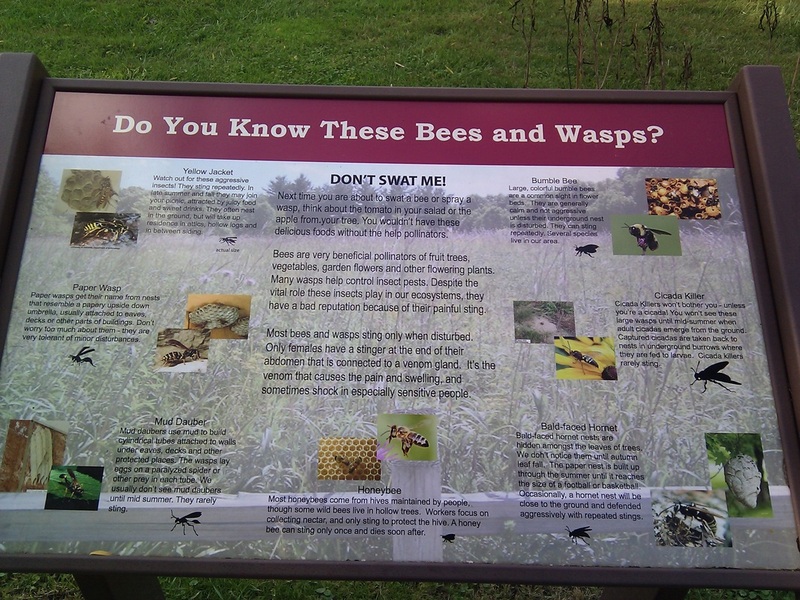 Image 27 is an interpretive sign explaining about bees and wasps. 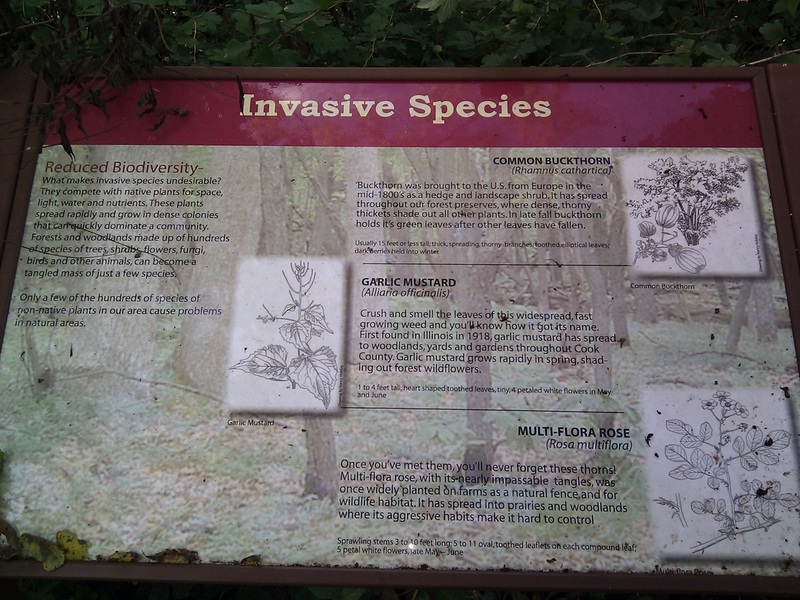 Image 28 is an interpretive sign, also along the trail, that teaches about invasive species. This outdoor classroom is surrounded by trees and natural materials. The benches are wooden, and so is the mulch on the ground. 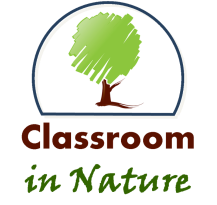 There are plants and decaying plaint matter around the classroom and so, there are not many man-made materials in the classroom besides a “No Picnics” sign. 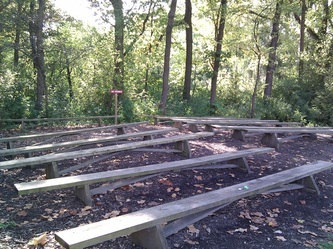 As stated above, there are miles of trails at this forest preserve connecting with the outdoor classroom. These trails bring you through a wooded area, as well as a grassland field, next to two bodies of water, and beehives. There are also some interpretive signs along the trail teaching about different subject matters, consisting of local topics of interest. The nature center is also located within steps of the outdoor classroom. This nature center includes exhibits with live animals and plants, teaching about local ecosystem structure, food chains, and archeology. The center also includes restroom facilities, forest preserve offices, and community rooms for teaching or instruction. The Little Red Schoolhouse outdoor classroom was well-maintained and looked as if it was used regularly for community programs or child instruction. It also was in a perfect location for community and student use whether visiting for pleasure, recreation, a community program, or with a school group. The outdoor classroom location allows for easy access to walk on the trails as well as incorporation of the nature center, all of which can be used to learn about the natural outdoors.